Recently I got a real “Dear Laurel letter.” Well, actually, it was a comment. She has difficult windows. Well, a difficult window situation. I asked her to send me a photo because it sparked an idea for a post. Sometimes. No wait. Not sometimes. Frequently, in newer homes I have no idea what the architect was thinking. Clearly, he wasn’t thinking; not about window treatments. However, even if he wasn’t, there is much that is not-that-great design-wise. This home is very lovely, but there is the issue with this window. This is a situation where we have two transoms. It’s funny because this is the kitchen and it seems like maybe this was built at a different time? But the window in the great room is a problem child for sure. But not a big problem. I made a little graphic to show two different options. The third option would be to go all the way up, but the sharp angle of the ceiling means the rod would have to come in further and I think it would look cramped and weird. I vote for option number 2. It balances out the large transoms and creates more drama. Is option number 1 a mistake? No, it’s not a mistake but it’s not helping anything either. Wonderful treatment in this library. I love the layering of the treatment for light control. Great solution for a large window with French doors and then a smaller window. Beautiful living room. 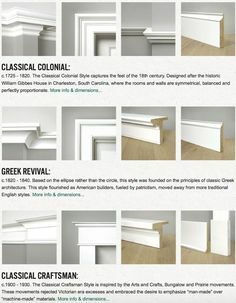 Sometimes the crown moulding can be a challenge, but it looks like they got it just right. They didn’t get it just right. I would’ve been fine with a little Roman shade layered over the blinds. These are very often troublesome for obvious reasons. This is an especially challenging situation. We have a corner and a Palladian window that doesn’t follow the natural line. The solution is to hang the side drapes and follow that line along the back wall. Normally, I’d like a little wider panel flanking these doors, but the simple panel seems to understand that it is not the star of the show. Nosiree! Not when you have these exquisite French doors and arched transoms. This is a good example of a rod that logically goes over the arched windows. No. I would’ve run the rod across like the one above. And please no scary hooky things. No. Please. No. I wouldn’t have done any drapes here, unless perhaps it was possible to go above the arch. And no truncated rods! I never saw this until a few years ago. It’s so bizarre, IMO. The drapes should look like they can close even if they don’t. And please move the painting over so the drapes aren’t eating it. This is from Markham Roberts’s fabulous room at the Kip’s Bay Showhouse. His window treatment is beyond glorious. And he used a panel and a half which even if the drapes are not meant to close is the appropriate amount of fabric for this size window and ceiling height. I met Jamie on the Design Bloggers Tour last fall. Super nice guy and obviously, supremely talented. He was unveiling a line of furniture for Theodore Alexander. I adore this room but I would love to see double the amount of fabric on this window. It doesn’t even look to be a full panel. It looks great on the other windows. The fabric looks heavy and rich. Great job for this contemporary living room. Phoebe Howard can do no wrong. One of my fave living rooms ever! I think Mer has redecorated it since this was taken. I met her last spring and found out the room is only 9 feet wide! This is a bay window with a deep sill so the drapes have to be mounted in front. When we measured for the drapes, (I needed Mario’s assistance for this one), we didn’t realize until the valance came down that there was NO PLACE to put our rod. It’s difficult to see here, but the window frame and opening was flush with the ceiling! Fortunately, we had time and the builder created a 4″ soffit for us to hang our drapes on! It looks so much better too! ***Note to self: Insist on the window treatments coming down if at all possible before measuring. I probably won’t, but I should. This is obviously a basement room with tiny little slits for windows. They put up some silhouette shades and drapes and then created “windows” with art. Brilliant! Exquisite room by Patricia McLean for the Atlanta Symphony Showhouse. I’m sure she wanted to shoot the architect. When you look at this image it looks weird, but then below it makes sense because there’s at least one other door with a transom. I think she did a great job with what she had to work with. It’s not that the room is an architectural failure. It’s not. It’s gorgeous, but I wish that the architects would take into consideration the fact that we are going to want to put up drapes. Here, I would’ve left off the drapes and just put Roman shades on the doors. But I’m not faulting the designer. Again, the architecture is not helping. 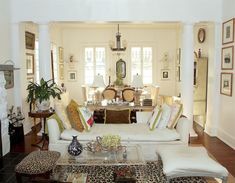 I love what Kristi has done here and especially that she has combined drapes and Roman shades. Since the windows on the right are different from the windows on the fireplace wall, this is a viable option. 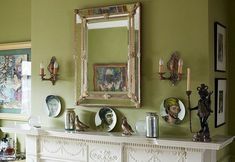 In so doing, it breaks up the sameness and makes the fireplace wall that much more of a focal point. About 16 years ago I had a client who had built her home and had been in it for about 10 years. I did her living room. 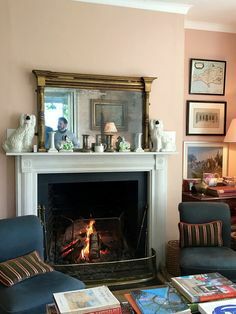 There was a lovely fireplace in the living room but the windows flanking it were 1 inch away from the mantel. Nobody caught it. There was a good three feet on the other side of each window. If the windows were 18″ over the windows would’ve been a good distance from the FIRE and centered. We did drapes pulled back to the opposite sides and it really helped create the illusion that the windows were not so close. Soft pretty eating area. Here, I would’ve done drapes with a ROD on the window on the left and then Roman Shades out of the same fabric over the built in area. This is a woman with nerves of steel (or else some really good prescription drugs) ;] and an AMAZING workroom. Think about what it took to pull this baby off! And a Greek Key to boot! Okay, I’m sure I’ve missed some goodies out there. I know I have, because there are a zillion difficult situations. Please share in the comments anything that you’ve encountered. For some other hideous decorating mistakes I’ve made, please click here. PS: I’d like to make a public apology to someone who is a lovely designer and blogger. I unknowingly posted an image of hers and said some disparaging things and I feel quite badly about it. However, the image is gone. I need to be more careful in the future. If you have time could you comment on drapes on windows that have a radiator cover in front of the window. My particular covers are an inch longer on each side than the window sill. To hang the drapes in the correct place over the window trim forces the drape to hit the radiator cover. I am not a fan of ones I have seen in homes that”drape” over the covers in dramatic fashion. Ahhh… the dreaded radiator cover and that goes for baseboard heating too, to some extent. First of all, the radiator cover should not extend past the window sill. How crazy is that? I’m assuming there is no option to change that, but that is my first thought. Assuming it cannot be changed, I don’t know how deep it is. One option would be to do a tie back drape. (I prefer hold backs that hold the drapes back.) That will keep the drape over the window casing which must be covered or will look strange, but on the other side of the radiator cover. Over the radiator is an option, but only if it’s no more than about 8″ deep. 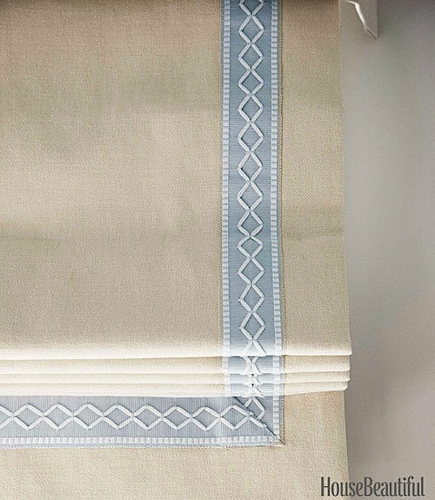 An extra deep bracket can be used for the drapes, but a return is essential, or better yet a valance and maybe a Roman shade underneath the drape. That will help justify the extra deep bracket. If you don’t know those terms, please consult with a professional workroom or designer. These are all wonderful. Love the greek key treatment.. Do you have any suggestions for sliding glass doors when here isn’t much wall space on either side? I’m stumped! Thanks. I guess you’ll have to cover up some glass, but since I can’t see the situation, it’s difficult to say. Always looking for new ideas…. You have addressed several difficult windows, but what would you suggest for attic windows? If the side walls slope down and make it impossible to run a rod above the window casing, is there an option other than Roman shades? I had a client who had this on two small windows flanking a fireplace. The rod was there but there was a grandmother-type shirred polyester thing. I replaced it with a wool share which had a pocket at the top and bottom and it looked terrific! I enjoyed your posts. I like the way you did the graphic with the two different lengths of window treatments. It really showed the different look. Can you tell me what you use to do that? I use a free program called Pic Monkey. Yes, there’s a little monkey and sometimes he winks at you. ;] I call it photoshop for smart dummies. Hi Laurel, another fantastic, informative post! Thank you! First, I love your blog! I’m a “serial renovator” (we are on our 12th house…) with a passion for houses and decorating. My husband and I have just purchased a post and beam house in SW CT and are in the midst of doing some major re-working. I’m discovering that renovating a post and beam home comes with lots of new challenges (no sheetrock ceilings – hence no recessed lighting for one!). I have one huge design challenge that ties into today’s post. Drapes… I have three 8′ sliders along the back wall of our living room that are framed – tightly – on three sides by massive beams. I want drapes that will close if possible, but I’m just not sure how to do it. I’m not sure if I can send you a pic in this comment but I’ll try. If I succeed, please know that the gross black track lights along the beams are going. As is the patio furniture that serves as seating so my workmen can eat their lunch in comfort! Hi Laurel! Such a timely post as I’m getting ready to help a friend with some tricky windows in a condo she just bought. Your post made me think of my own tricky windows, however. I, too, have a deeply set bay in my living room, with a soffit in front of it. I’d been considering running drapes along the soffit and was tickled to see how lovely it is in your home. Thanks Sally! That means a lot–especially coming from a workroom! I agree 100% with all your comments! And what in heaven’s name are builders and architects THINKING???? A double transom with a Palladian??? Mercy! You know that probably most of the builders out there haven’t had a day of art/design history–at least their designs say so. Thank you Danielle. Yes, it’s always been a frustration. It wasn’t that long ago that I would go in some homes and there was no place to put the “old fashioned” TV. Remember those? Yes, that is another solution. Not a fan of houzz, however, since they have clearly exploited designers. You bring up a great point in that short drapes, which I only will do in a kid’s room should not be hung high for the reason you stated. But no one told you, so how are you supposed to know?